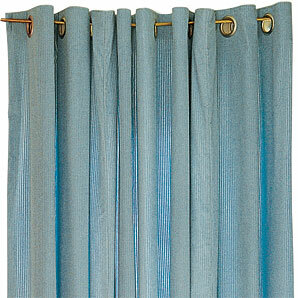 Looking for a beautiful Cheap Curtains at unbeatable prices? Nets2Go online is known for value for money, pretty stylish curtains and matching accessories. Add atmosphere to the interior of your home with our extensive range of curtain fabrics of classic designs in various tints and shades for understated elegance. All of our curtains come fully lined, or if you prefer we can create any made-to-measure cheap curtains from our wide variety of material with modern tiebacks, poles etc. All our bespoke curtains, fabrics and soft furnishings are made to a very high standard, at our workshop by first class cutters and machinists at a reasonable cost to you. We provide a rich collection of drapes made from natural fibres suitable for both light or heavy curtains, although practically most natural fibers are sensitive to sunlight, cotton seems to be one of the most resistant of all, it is fresh, airy and by selecting the right colours, you can achieve that clean and bright effect of light and shadow that gives off an individual focal point to your home. We have something for everyone. Perhaps you like the silk effect curtains for that beautiful looking room, where you want to achieve a pretty effect, or a stunning floral design with a traditional and definite feminine personality that brings inspirations from the English garden into your home, or simply keep out unfiltered sunlight and be shielded from prying eyes. You can also create a French countryside lifestyle, just by adding a good cheap curtains, our fabrics can be used to enrich every window. We supply all types of made to measure curtains, tiebacks, poles, rails, blinds a nd much more from our extensive range of ready made stock items. To ensure that all our curtains and blinds, whether they are the cheap curtain type or the more expensive types, we make sure that they will hang beautifully at your window when you purchase from us. A well-dressed window can completely change the aspect of a room and create a stunning and beautiful effect even with just one hue. From a decorating perspective, a large and bold scale of design is ideal for making a grand statement. We source a large variety of contemporary and classic fabrics, offering you a great choice of ready-made curtains to dress your interior with. We pride ourselves on working quickly and efficiently and make all our curtains in our own shop and only accept quality fabric from the UK's top producers. Have some peace and quiet, enjoy the security and pleasure of the warmth your home can bring with our good quality cheap curtains at prices that can suit any budget.